We research the properties of aerosol particles in the Earth’s atmosphere and how these particles influence clouds through a combination of laboratory, field and numerical modelling studies. Our work focuses on improving understanding of the fundamental role aerosols and clouds play in our planet’s climate system, which will ultimately lead to improved weather and climate models. 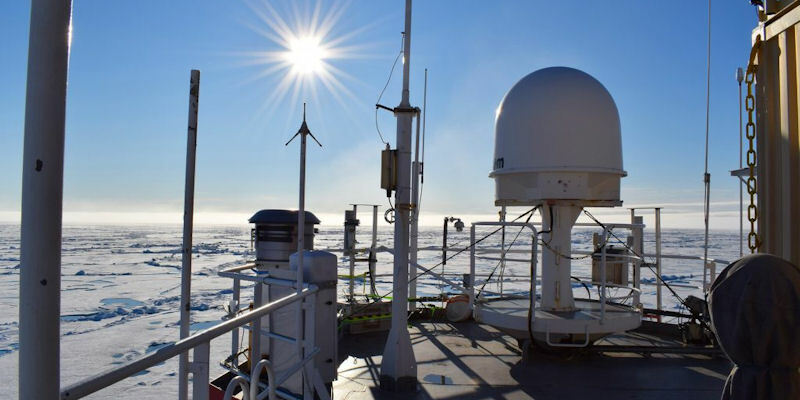 This involves, for example, measuring how efficiently various aerosol particles trigger ice formation in clouds, understanding the crystal structure of atmospheric ice and studying the properties and state of aerosol particles under atmospheric conditions. We also use our knowledge of atmospheric ice nucleation to devise strategies for controlling freezing in industrial applications such as cryopreservation – a great example of how ‘blue skies’ research leads to unexpected outcomes. Professor Ben Murray leads the group in collaboration with Dr Jim McQuaid. We also work closely with Professor Ken Carslaw, Dr Steven Dobbie, Professor Paul Field and Dr Ryan Neely. Our facilities and instruments include: an icepod laboratory and a cloud expansion chamber for counting ice nucleating particles. Understanding aerosol properties and how aerosol particles influence clouds throughout the Earth’s atmosphere from the boundary layer to the mesopause are our main areas of interest. Mixed-phase clouds exist below 0°C, when ice becomes the thermodynamically favoured phase, and above ~-35°C, when ice spontaneously nucleates homogeneously in water droplets. In the absence of ice nuclei (IN), clouds warmer than ~35°C will be composed entirely of metastable supercooled water droplets, but the presence of ice nuclei can cause the cloud to glaciate. For a demonstration of supercooled water freezing see: http://www.youtube.com/watch?v=0JtBZGXd5zo. Some cloud droplets contain particles, known as ice nucleating particles (INP), which can catalyse freezing. When a cloud droplet heterogeneously freezes, the resulting ice particle will grow at the expense of any unfrozen droplets. Thus, INP have the potential to greatly alter the nature of mixed-phase clouds. This effect, known as the Bergeron-Findeisen process, normally results in the rapid glaciation of the entire cloud, precipitation of resulting large ice crystals and reduced cloud lifetime. The coldest part of the troposphere is the tropical tropopause region at an altitude of around 17 km where clouds form at temperatures down to 185 K (-88°C). Under these conditions, a metastable type of ice with a crystal structure distinct from that of standard hexagonal ice can form and persist. Our work has revealed that this kind of ice has a structure which we have named ‘stacking disordered ice’ (Malkin et al. PNAS, 2012; Malkin et al. PCCP, 2015). Clouds which are composed only of ice also form throughout the upper troposphere where temperatures are colder than about -40oC. As with mixed phase clouds, we quantify the ice nucleation taking place by looking at the aerosol types present in the upper troposphere. We have thus discovered a new class of ice-nucleating aerosol in the upper troposphere – glassy aerosol (Murray et al., Nature Geoscience, 2010). The coldest place in the Earth’s atmosphere is the high latitude mesopause region which is around 82-88 km in altitude during summer. 'Noctilucent clouds' form in this region, so-called because they can only be seen glowing in the twilight sky when the lower atmosphere is in shadow. The nucleation mechanisms of the ice crystals and also their microphysical properties remain a mystery (Murray et al., JASTP, 2015). We have suggested that this is the only region of the atmosphere in which water could condense spontaneously from the air without the need for an existing particle (Murray and Jensen, JASTP, 2010). Atmospheric aerosol particles which contain organic material can become ultra-viscous or glassy at low relative humidity and/or low temperature. There is a thriving debate about quite how important this is and we recently developed a technique to quantify diffusion rather than measure viscosity (Price et al., ACP, 2014). Our research indicates that glassy aerosol may have a significant impact on cold cirrus clouds by providing a surface which can nucleate ice crystals (Murray et al., Nature Geoscience, 2010; Wilson et al., ACP, 2012). We use a global aerosol model (GLOMAP) to predict the global distribution of ice nucleating aerosol types. This modelling work makes use of the data from the labs in order to define the ice nucleating efficiency of a range of aerosol types and we then test our predictions against our field measurements of atmospheric ice nucleating particles. An example is where we demonstrated that one particular mineral in desert dusts makes this dust effective at nucleating ice and were able to use this lab data in GLOMAP to predict the global distribution of desert dust ice nucleating particles (Atkinson et al. Nature, 2013). Cryopreservation is used to store biological samples at very low temperatures for periods of up to many years. The efficient and effective storage of cells is key to the success of rapidly expanding industries such as in-vitro fertilization and regenerative medicine as well as for storing natural environmental samples. Its application is limited at present, however, by a lack of suitable ice nucleating materials. Through our fundamental atmospheric work and close link to Asymptote Ltd, a small/medium enterprise (SME) which specialises in cryopreservation, we are in a unique position to address this problem. We have a patent application on this work and publications on the survival of cells at low temperatures (Morris et al., Cryobiology, 2012; Clark et al., PLOS ONE, 2013). If you would like to discuss an area of research in more detail please contact: Professor Ben Murray.